Home » Features » Star Trek Fans In Your House? Star Trek Fans In Your House? Titan books recently sent me a damn cool book that is perfect for the trekkies on your gift list. 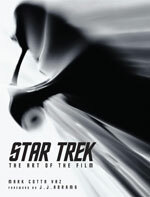 STAR TREK THE ART OF THE FILM by Mark Cottr Vaz is a perfect book to go along with the the DVD release of the movie. 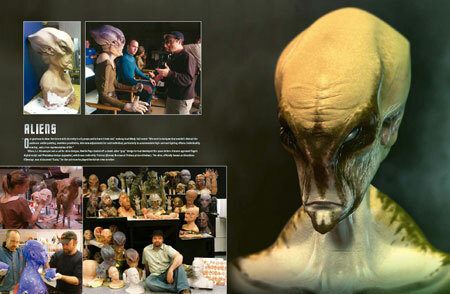 Over sized and full color this book goes over the set designs, the ships and special effects, and costumes for all the various aliens. It was really interesting to see the different ideas that came into play for what Spock would wear and the reasons for why ships look the way they do. This may be a bit much for the casual fan, but if someone you know owns all the movies and is a fan they will love this. Seeing behind the scenes on any movie is always a treat, a look at how the magic is done, but for something this big on special effects its really something extra cool.